Crotalaria benghalensis Lam., Crotalaria fenestrata Sims, Crotalaria ferestrata Sims, Crotalaria porrecta Wall., Crotalaria sericea Willd., Crotalaria tenuifolia Roxb., Crotalaria viminea Wall. 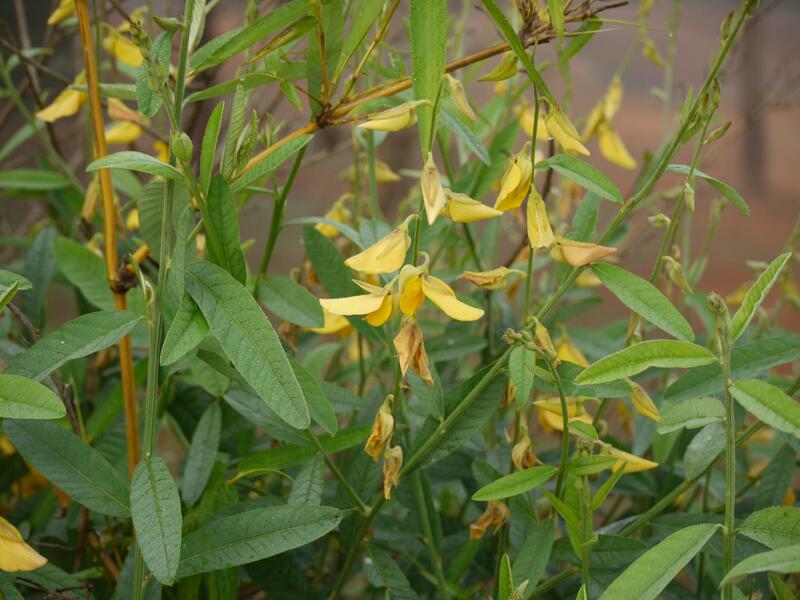 Sunn hemp (Crotalaria juncea L.) is a multipurpose tropical and subtropical legume grown in many countries, notably India, mainly for its high quality fibre. The crop is grown for green manure, as a soil improver and as a disease break in cereal or other crop rotations (Tripathi et al., 2013). Sunn hemp is locally used as fodder (Sarkar et al., 2015). Crotalaria juncea is an annual erect shrubby herbaceous legume growing to a height of 1-4 m. It is strongly taprooted and has several lateral roots. Sunn hemp is a many-branched species. The stems are up to 2 cm in diameter, cylindrical and ribbed. The leaves are spirally arranged along the stems, hairy, simple, oblong-lanceolate or elliptical in shape, 4-13 cm long x 0.5-3 cm wide (FAO, 2017; Duke, 1983). The inflorescence is a terminal open raceme, up to 25 cm long, bearing showy, deep-yellow papillonaceous flowers. The fruit is a cylindrical, many seeded, hairy pod, light brown when mature, about 3-6 cm long x 1-2 cm in diameter. The seeds are cordiform, 6 mm long, dark brown to black in colour. The number of seeds/kg is highly variable, ranging from 18,000 to 35,000 (FAO, 2017; Duke, 1983). The genus name means "rattle", reminding the sound produced by the seeds in the pods at maturity, and the epithete for the species "juncea" was given by Linnaeus for the resemblance of sunn hemp with spanish broom Spartium junceaum L. (Orwa et al., 2009). Crotalaria juncea is the fastest growing and most important species of the Crotalaria genus (USDA, 1999). Sunn hemp, like hemp (Cannabis sativa), is mainly grown as a fibre crop that was much used in the traditional manufacture of ropes, strings, twines, floor mat, and fishing nets. It has regained interest in the late 2000s as its fibre is reported to be more environmentally friendly than synthetic fibres, and having valuable traits for paper industries. Sunn hemp foliage can be used as a protein source to supplement poor quality roughage. Raw seeds are toxic and can not be fed to cattle without prior boiling. The plant can be ploughed down for green manure in the early flowering stage. It can be useful as an intercropping species, in cereal fields or for other cash crops. Sunn hemp can suppress weeds thanks to the shade made by its dense canopy (FAO, 2017; Orwa et al., 2009; Cook et al., 2005). Crotalaria juncea originated from India and has been cultivated there since the earlier times of agriculture. It was first reported in Sanskrit literature in 400 BCE (Sarkar et al., 2015). Sunn hemp is now widely cultivated in many tropical and subtropical areas in the world, such as India, Bangladesh, Brazil, and even in cold temperate steppes (Cook et al., 2005). In its main area of cultivation in India, sunn hemp is found from 17°N to 30°N and grows at altitudes between sea level and 1500 m, where average annual temperature ranges between 15-27.5°C. In Brazil, it grows from the Amazon belt to 22.5°S where the average annual temperature range is 18-27°C. Elsewhere, it is cultivated in areas where average annual temperatures are as low as 8.4°C, providing there is a frost-free growing period of 2-3 months. Sunn hemp can withstand light frost (not less than -2°C) without injury, but growth and N fixation are reduced (Cook et al., 2005). Sunn hemp is a drought-resistant species and it can grow where average annual rainfall is as low as 200 mm. Irrigation is necessary for maximum growth and nitrogen fixation (minimum of 25 mm of water/week). It is more productive with relatively high humidity. 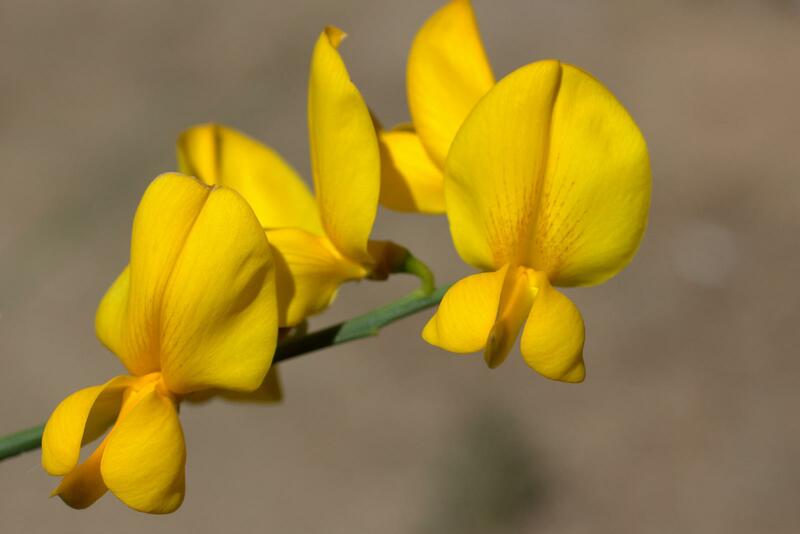 Crotalaria juncea does well on a wide range of soils provided they are well-drained. It does not withstand waterlogging. When it is grown for fibre, sunn hemp does better on fairly light textured soil (sandy loam or loam) of moderate or good fertility. For other purposes, it is possible to grow it on clayey soils of low fertility, provided they are well-drained. A neutral range of pH is preferred but sunn hemp can grow on soils with pH ranging from 5 to 8.4 where phosphorus is available. Sunn hemp tolerance of salinity is generally low but there have been reports of moderate tolerance (Orwa et al., 2009; Cook et al., 2005). The fibre production of sunn hemp was the most important after World War II as its high quality fibre had been necessary to make various war equipments. In the 1960s in India, sunn hemp was cultivated on about 200,000 ha. The cultivation of sunn hemp steadily decreased with the use of synthetic fibres and represented no more than 31,000 ha in 2008 (Sarkar et al., 2015). The late 2000s saw a renewed interest for the plant as a multipurpose legume. India is the first sunn hemp fibre producer (23% of worldwide production), having the largest cultivation area (27% in area). Other important producers are Bangladesh and Brazil (Sarkar et al., 2015). In India, green biomass production from Crotalaria juncea sown in the pre-monsoon period ranged between 22 and 27 t/ha (Tripathi et al., 2013). In Cuba, it was possible to get 3.4 t DM/ha in 2 cuts (Machado et al., 1994). Worldwide, green matter yield averages 18-27 t/ha and forage yield is about 5-19 t/ha (Sarkar et al., 2015). In Thailand, when cultivated as a green manure after rice, sunn hemp yielded 2 t/ha of high quality DM in 6-8 weeks (FAO, 2017). 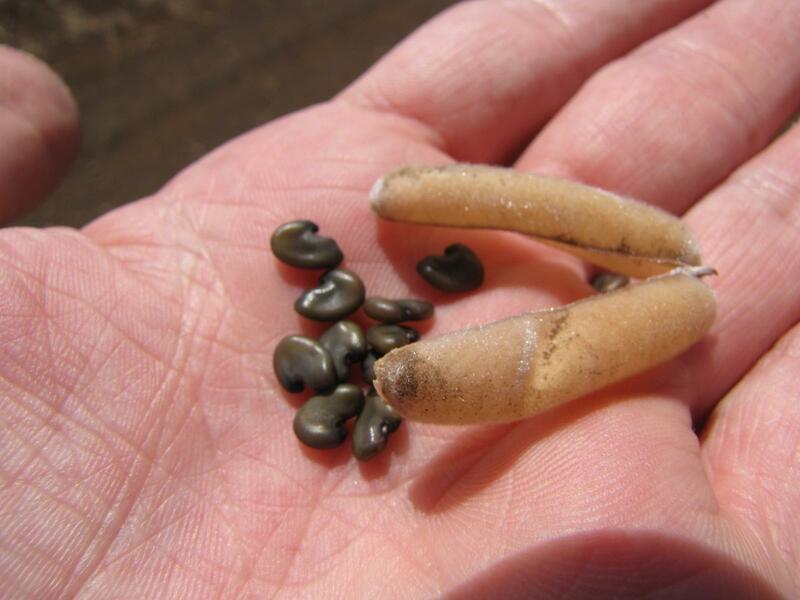 Crotalaria juncea is propagated by seeds under moist and frost-free conditions, sowing periods varying upon location and final use of sunn hemp. As a green manure, sunn hemp is mainly grown during the rainy season. Sunn hemp should be preferably sown in a well-prepared, fertilized, weeded, seedbed to a depth of 2-3 cm. Seeds can be broadcast or sown in rows. They germinate within 3 days under favourable conditions. Sunn hemp is a fast growing species that suppresses weeds by shading them out once sufficient height is reached (FAO, 2017). Density of sowing depends on which use sunn hemp is intended for, and on the place where it is grown. When grown for fibre, sunn hemp should be sown at higher seed rate in order to promote erect growth, stem elongation and high quality fibre. Under rainfed conditions, seed rates ranging from 100 to 240 kg/ha were recommended for broadcasting while only 66 kg were enough for plantation in rows, and resulted in higher yields (Maroyi, 2011). Where irrigation is possible, sunn hemp is sown in small plots surrounded by furrows in which water is distributed at intervals of 10-15 days. Sunn hemp can be used for rotation with many cash crops. In India, recommended crop successions are sunn hemp-wheat, sunn hemp-potato, sunn hemp-mustard, sunn hemp-paddy-wheat, sunn hemp-mustard-wheat. The highest performing rotation was the sunn hemp-wheat rotation in which the yield of wheat was found to increase by 10-15% (Chaudhury et al., 1997). In Brazil, sunn hemp is intercropped with wheat, sorghum, sugarcane and beans (Cook et al., 1996). It is intercropped with cotton in the USA and with kenaf in Cuba (Chaudhury et al., 1997). Harvesting should be done at the flowering stage (60-90 days after sowing) since the fibre is thinner at this stage. Harvesting can be done by hand or with a mechanical harvester. The top portion of the plants are chopped off soon after harvesting for use as cattle fodder (Sarkar et al., 2015). The main portion of the stem is left to dry on the ground during 1 to 6 days, depending on places, so that it shed its leaves and becomes ready for retting. In some areas, stems are left up to 15 days on the ground and retting occurs naturally thanks to morning dew (Sarkar et al., 2015). As green manure, sunn hemp should be ploughed in 2 months after sowing when the plants begin to flower as it decomposes more rapidly and it will have a positive N balance at this stage. It was recommended that green manure fallow lasts at least 6 months for a positive effect on soil characteristics. A fallow of up to 18 months was found beneficial for soil fertility but could have economic consequences (Maroyi, 2011). Sunn hemp intended for forage can be harvested 4 times, starting 6-8 weeks after sowing and then every 4 weeks (Orwa et al., 2009). Sunn hemp should be cut for hay in the early flowering stage, 1.5-2.5 months after planting (FAO, 2017). It has been recommended to sun-dry sunn hemp foliage prior to feeding animals as they do not eat fresh sunn hemp (FAO, 2017). However, Indian farmers have been reported to feed it green to cattle (Sarkar et al., 2015). When sunn hemp has been harvested for fibre, the top portion of the stem is used for fodder or hay after mixing with paddy straw (Sarkar et al., 2015). In Brazil, a mixture of maize and sunn hemp (in a 6:20 seed ratio) grown for silage production yielded 16.2 t/ha while it only yielded 12.9 t/ha when grown alone. The protein yielded by the mixture was 1.30-1.45 t vs. 0.69 t in pure maize stand. In the silage, DM content was between 30.6 and 32.4%. Protein content was higher for the mixture and silage carbohydrates were not affected. In vitro digestibility, Ca, P and ammonium-N contents, and pH were unaffected (Obeid et al., 1992). Crotalaria juncea can fix about 50-60 kg N/ha within 60-90 days of cultivation. It provides 60 kg N/ha to the soil when it is used as green manure. Sunn hemp has the potential to improve soil properties, to build organic matter and sequester carbon in the soil. It can be used for soil reclamation (Sarkar et al., 2015). Sunn hemp is a non-host or poor host for many plant-parasitic nematodes including Meloidogyne spp. and Rotylenchulus reniformis (Wang et al., 2002; Wang et al., 2001; Rotar et al., 1983). Sunn hemp has thus been recommended for rotation with crops prone to nematode infection, such as potato, tobacco, etc. (Sarkar et al., 2015). Sunn hemp has vigorous growth and dense canopy, two elements that are favourable to weed control (Maroyi, 2011; Orwa et al., 2009; Cook et al., 2005). 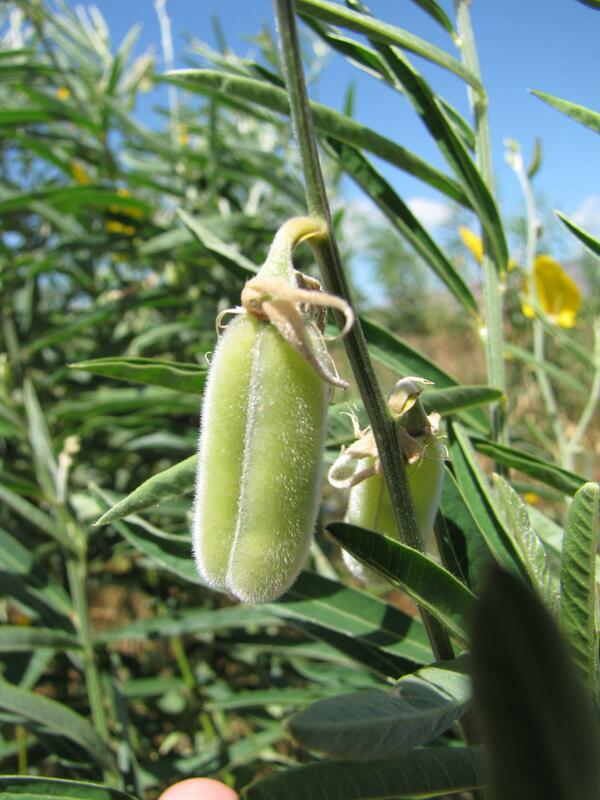 Sunn hemp has been used as an alternative to winter legume cover crops. It can improve soil properties, reduce soil erosion, conserve soil water, and recycle plant nutrients (USDA, 1999). Crotalaria juncea is a legume and as such tends to have a high protein content both in its forage and seeds. However, while leaf quality is high (25-30% protein, 22-28% NDF, 22-27% ADF) stems have a low quality (about 8-10% protein, 74-76% NDF, 64-65% ADF). When 80% of the plants are blooming, 35-40% of the biomass is made up of leaves. A stand that grows until flowering may lose some of the lower leaves and the leaf:stem ration decreases, resulting in a forage of lower quality. Protein contents lower than 10% have been reported. As a result, early harvesting is better for forage use because the plants are less mature and they contain a higher proportion of high forage quality leaves (Mosjidis et al., 2013). In Brazil, none of the goats receiving sunn hemp seeds in their daily diet at high (10 or 20 g seeds/kg daily diet) or low (2 g seeds kg daily diet) level during long periods (150 days) developed signs of poisoning or changes in biochemical parameters. The sunn hemp seeds contained 0.18% total alkaloids (trichodesmine, junceine being the most important) (Pires et al., 2015). Horses and pigs should not be fed on sunn hemp (Cook et al., 2005). Crotalaria juncea is commonly grown for fodder. It can be used as fresh forage or made into hay. In Andhra Pradesh, India, it is stacked in alternate layers with rice straw to increase the value of the straw (Göhl, 1982). Sunn hemp is readily grazed by goats and sheep before the plants start blooming. Goats will eat the top of the stems and all leaves of the more mature stem section. Grazing can start when plants are about 45-90 cm tall (Mosjidis et al., 2013). Crotalaria juncea can be used for cattle forage during late summer and early fall, but the amount of fibre in stems is too high 6 weeks after planting to be used as suitable forage (Mansoer et al., 1997). In Bangladesh, in sacco protein disappearance of sunn hemp hay measured in indigenous cattle reached 90% after 72h. At a low passage rate (2%), protein degradability was 78%, equal to that of prickly sesban (Sesbania aculeata) foliage, and higher than that of all other forage grasses, including oat forage (Avena sativa), elephant grass (Pennisetum purpureum), dhal grass (Hymenachne pseudointerrupta), and also than that of legume hays, including grasspea (Lathyrus sativus) hay, or black gram (Vigna mungo) hay (Khandaker et al., 1996). In a trial with rams in India, DM intake was 2.57 kg/100 kg BW. Digestibility coefficients on consumption basis showed that the portion consumed was highly digestible (OM digestibility 65%). However, on feed basis the digestibility coefficients were very poor (OM digestibility 33%) due to the fact that the rams chose the leafier parts of the plant and rejected the stems (Balaraman et al., 1974 cited by Sarwatt et al., 1988). Sunn hemp hay could be used to supplement crossbred bulls and heifers receiving a sorghum straw-based ration (Reddy et al., 1994a; Reddy et al., 1994b). Compared to other valuable supplements such as leucaena (Leucaena leucocephala), dry mixed grasses or dry mixed grasses and concentrate, sunn hemp supplementation resulted in the higher OM and protein digestibilities in bulls. All the bulls had positive nitrogen, calcium and phosphorus balances. The digestible protein and total digestible nutrient (TDN) contents and intake were higher than the maintenance requirements for bulls. Nutrient digestibility and utilization were better in animals fed on sunn hemp supplement (Reddy et al., 1994a). In heifers, a sorghum straw-based diet supplemented with sunn hemp + concentrate during 180 days resulted in higher DM intake and higher average daily gain (ADG) compared to control (straw + concentrate). Though the ratio of concentrate:roughage was 61.5:38.5 in the complete diet (straw + sunn hemp hay + concentrate), and was only 52:48 in the control (straw + concentrate), feed costs were reduced by 15% (Reddy et al., 1994b). These results confirmed the results obtained earlier by the same author through in vitro assessment of ruminal fermentation of the same supplements (Reddy et al., 1993). It was possible to feed safely lambs during 10 days at up to 45% with sunn hemp harvested at flowering stage. The animals had positive N, Ca and P balance. However, the digestibilities of OM, CF and N-free extract decreased with increasing percentage of sunn hemp in the diet (Reddy et al., 1999). When sunn hemp hay was included at 60% in the ration of rams, it resulted in slightly lower DM intake than leucaena leaf meal. The diet had the same apparent digestibility of DM, CP and N-free extract, but lower TDN (Prasad et al., 1999). 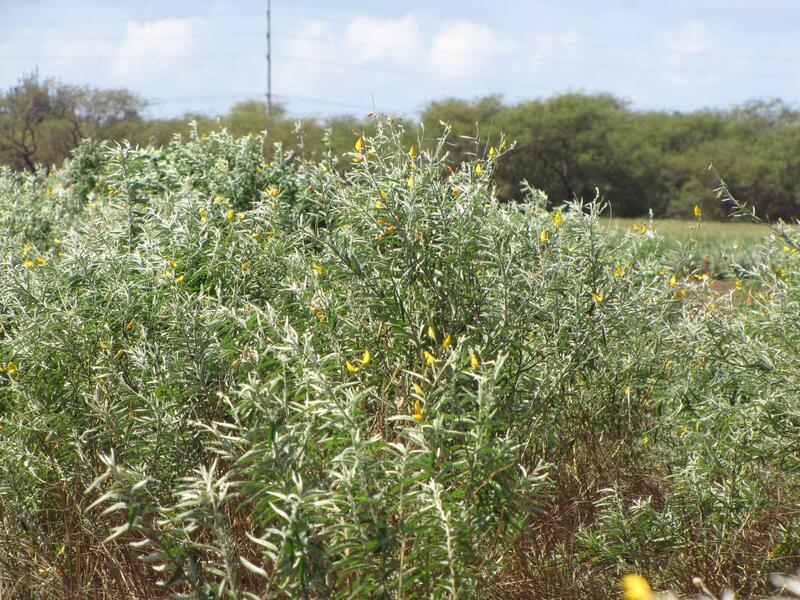 Sunn hemp hay and other forage legumes such as Caribbean stylo (Stylosanthes hamata), cowpea (Vigna unguiculata) were assessed during a long lasting (91 days) feeding trial in lambs. The diets were isonitrogenous. Sunn hemp hay could not compare to other hays for any parameter (ADG, DM intake and feed efficiency) (Murthy et al., 2002). Sheep will suffer from toxicity if fed large quantities of sunn hemp seeds (FAO, 2017). In Brazil, goats could eat sunn hemp seeds without showing any signs of toxicity (see Potential constraints above) (Pires et al., 2015). In India, male goats were fed on a diet containing 99% sunn hemp seeds, or on a diet containing 56% sunn hemp seeds and 43% groudnut cake. Animals all had positive balance for N, Ca and P. DM intake was higher for the diet containing only 56% sunn hemp seeds and TDN was 76,4% (Ghosh et al., 1990). Pigs should not be fed on Crotalaria juncea (Cook et al., 2005). Fresh sunn hemp foliage has been known for a long time to be very palatable to rabbits (Vandoni, 1952; Torres, 1954). Rabbits selected exclusively sunn hemp cuts from a mixture of this forage with Crotalaria breviflora cuts. Unlike other Crotalaria species, no toxicity appeared in rabbits after 10 days of sunn hemp foliage consumption (Vandoni, 1952). Included at 27% of a balanced diet distributed to growing rabbits during 8 weeks, dried sunn hemp provided growth performance, similar (non significantly better) to the berseem-based control and other legumes forages included at the same level, despite a lower digestible protein content of 13.4% DM vs. 17.7 to 22.3% DM for the other forages (Rao et al., 1986). 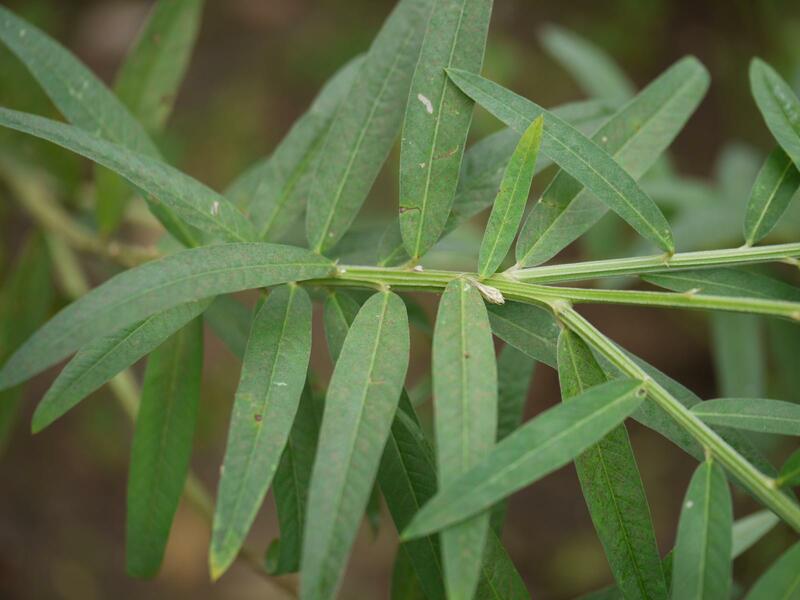 Digestibility of DM, ether extract and nitrogen-free extract of sunn hemp forage was similar to that of other more or less unconventional legume forages tested (Rao et al., 1987). It can thus be concluded that fresh or dry sunn hemp forage is a suitable forage for rabbits. Its phosphorus content is relatively high for a legume forage (0.65% DM), whereas it calcium content (1.13% DM) is more typical (Rao et al., 1986). No information seems available (as of 2017) in the international literature on the suitability of sunn hemp seeds for rabbit feeding. Horses should not be fed Crotalaria juncea (Cook et al., 2005).